This morning, I took a break from contemplating the ups and downs of the operatic rehearsal process, and popped on-line. I quickly found myself reading the New York Times Magazine article about David Mitchell. How I ended up there, I’m not sure. My book club read his “Cloud Atlas” many, many months ago, and it sparked a good conversation. This morning, the author’s name caught my eye. I love that reading inspires writing. Mitchell suggests that all the reading he did as a kid made him a writer. Reading about him made me want to finally finish a post that I started writing a couple of weeks ago. It’s akin to wanting to hit a practice room after attending a great performance, I figure. I admit that I had been dragging my feet on posting a post-Italy trip post because I couldn’t quite find my way into it. I had all of these ideas about art reflecting life, and life reflecting art, and art reflecting art, but then David Mitchell had to announce that I was making things too complicated. Art is about people. The Caravaggio exhibit at the Pitti Palace in Florence then, is that about people? A couple of weeks ago, I was standing in that exhibit, in the Medici’s old house, listening to a lot of strangers commenting to each other in various languages, all looking at the same 17th century artwork. Yes, art is about bringing people together. This particular exhibit highlights the aptly labeled “caravaggeschi,” the artists who were greatly influenced by the one great artist (who was, I can’t help but emphasize, influenced by other great artists). Yes, art is also about the people who create it. The paintings themselves are clearly of people: Biblical scenes, political figures, pretty faces…I stopped dead in my tracks when I saw Caravaggio’s Tooth Puller. Definitely about people. My favorite part about that painting appeared the next day in the Santa Maria Novella train station. I was guarding backpacks and suitcases while my travel buddy grabbed some provisions. Guarding backpacks and suitcases in a busy train station affords ample time for people watching (art! ), which is half the fun of traveling. A little girl walked back and forth with her mom, panino in hand, then mouth, then hand, then mouth. Suddenly, she yelped something of an Italian barbaric yelp, and before a second had passed, her mother’s hand, armed with a napkin, took the place of that panino and pulled out a tooth. The girl was jumping at that point. No grimace of Caravaggio’s Tooth Pull-ed, but a holey smile of straight up happiness. Art reflecting life? Life reflecting art? 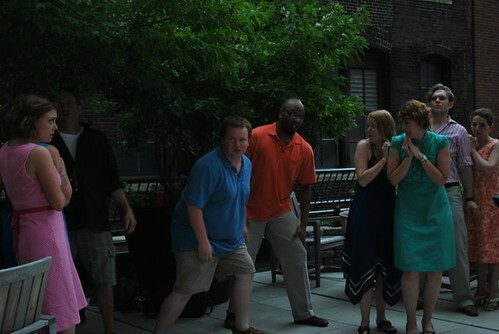 Sunday night, some friends hosted a fundraiser for Union Avenue Opera on a rooftop downtown. Yes, there was some singing in English, Italian and French. There were flimsy swords, impromptu dance moves, scary pirates, sirens blaring, winds a-blowing, dogs barking, and napkins flying. Most importantly though, the roof was filled with a lot of people having a good time. How artistic. Scary pirates in collared shirts. Frightened damsels in dresses. Photo by Dana Stone, UAO administrator extraordinaire.